Treasury warrant to the Customs Commissioners to appoint Peter Mabyn a coastwaiter, London port loco Cha. Bishop. Out Letters (Customs) XIII, p. 50. Charles Bishop as surveyor, waiter and searcher at Harwich loco said Peter Maybin. Same to John Smith, Receiver of Crown Revenues for cos. Middlesex etc., to pay 175l. 12s. 0d. to John Jones of Golenog, co. Montgomery, for his disbursements in discovering and seizing the estates of the late Marquess of Powis; making (with 83l. already received) 258l. 12s. 0d. in all: to be paid out of the moneys arising from said estates. Money Book XII, p. 108. July 17 [? Sept. 17]. Same to the Receipt for tallies on the Excise for 843l. 1s. 0d. to John Trussell, gent., in repayment of so much lent by him thereon July 14 inst. Ibid, p. 107. Henry Guy to said Smith to pay into the Exchequer all the moneys in his hands of the profits of the Marquess of Powis's forfeited estate. (Same to the Auditor of the Receipt to issue 250l. thereout to the Paymaster of the Works upon account of works and repairs done or to be done at Powys House.) Disposition Book XI, k p. 189. Same to Thomas Edwards to attend my Lords on Friday next on behalf of the merchants at the hearing between them and Mr. Tindale, searcher of Bristol port, touching his fees. (The like notice to the Customs Commissioners; and to Mr. Tindale.) Out Letters (General) XIV, p. 119. Same to Mr. Clarke to procure a royal warrant, to be signed by the Queen, for taking off the respites for Dec., 1689, on the Regiment late under Col. Robert Byerley. Ibid. Same to the Earl of Ranelagh to report on the enclosed petition of William Woolet and others concerning 1,757l. 4s. 4d. due to them for accoutrements furnished to Col. Langston's Regiment of Horse. Ibid, p. 120. 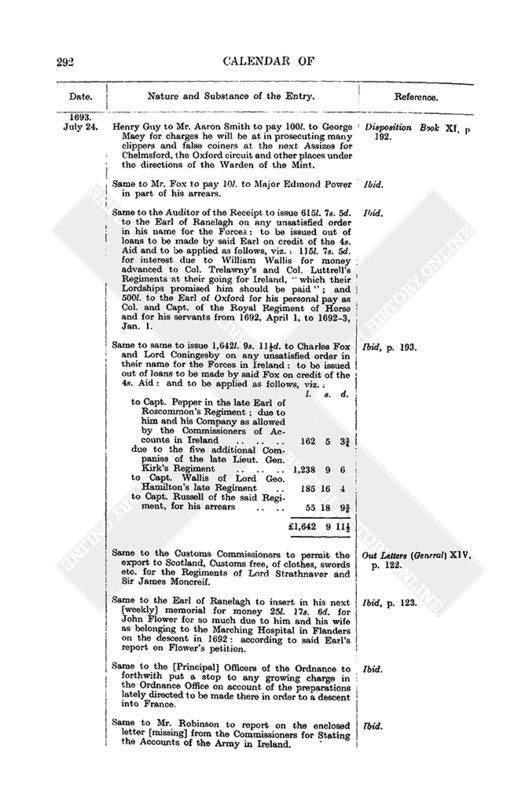 Treasury reference to the Attorney or Solicitor General of the petition of Craven Howard, John Harrington, William Jarman, Huntley Bigg and Thomas Wickham to the King, praying a grant for 99 years of such waters as run down the common sewers within London, Westminster and the Bills of Mortality at the rent of 5 marks per an. : in order to a public good. Reference Book VII, p. 1. Same to George Clarke of the petition of David Bourke et al., praying their pay as officers of the Army to enable them to repair forthwith to the Emperor's service. Ibid. Same to the Commissioners for Prizes of the petition of Jahleal Brenton, shewing that there are several prizes brought into Boston and disposed of without answering their Majesties' tenths; there being no person there appointed to receive same: therefore praying an authority to receive their Majesties' part. Ibid, p. 2. 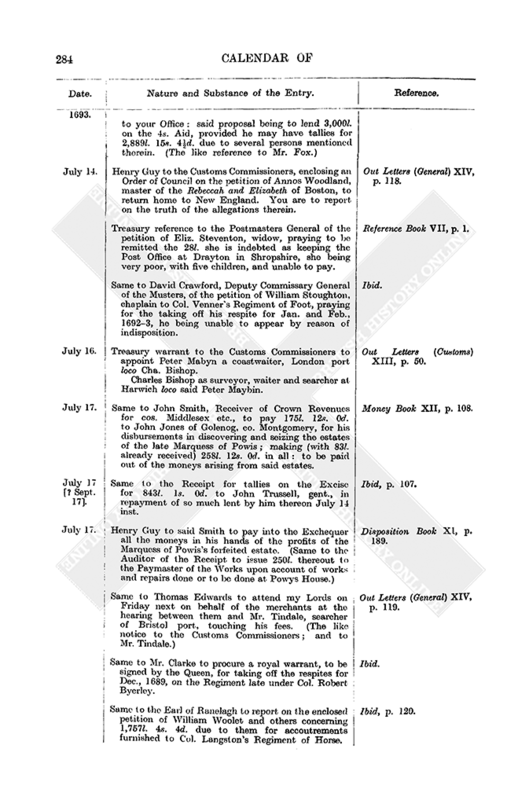 Treasury warrant to the King's Remembrancer to take Henry Carew's securities detailed, see supra, p. 276, for his office of one of the four Tellers of the Receipt loco John Loving, deceased. (Same to the Barons of the Exchequer to swear said Carew into said office.) Warrants not Relating to Money XIV, p. 204. Same to the Excise Commissioners to discharge William Buggin as administrator of Robert Buggin of a bond entered into by said Robert (together with Ja. Evett) as surety for Giles Baker, who in 1686–7, Mar. 3, was appointed one of the Receivers of the duty on coffee, who died in that office 1690, Sept., indebted 370l. 18s. 8d. to the King, of which only 38l. 15s. 0d. was received by him before the abdication of King James II, and as the said Robert died 22 May, 1688, the said administrator made distribution of his estate not knowing of said surety bond: and it being the opinion of Mr. Ward, Attorney General, and Mr. Hawles of Lincolns Inn that the said Buggins' bond extends no further than the continuance of Baker's employment by virtue of his deputation, which was determined by the said abdication of James II. On payment of said 38l. 15s. 0d. by said William Buggins the bond is therefore hereby to be discharged. Ibid, p. 220. 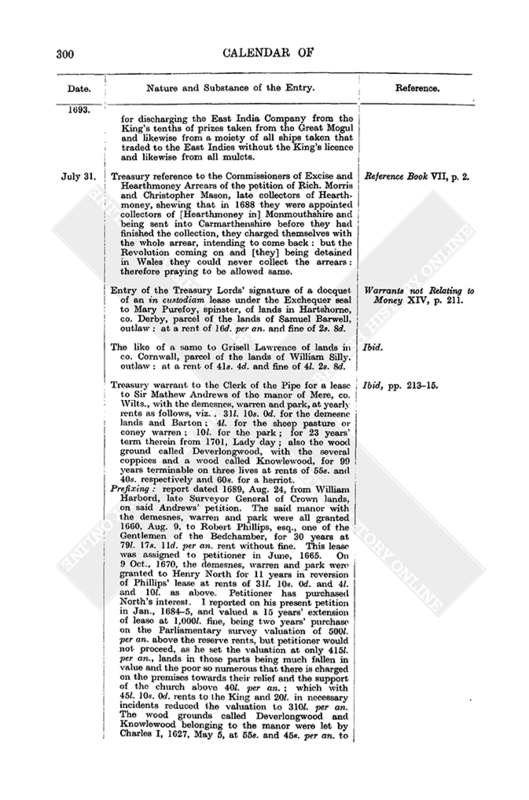 Entry of a Treasury caveat in behalf of Col. Edward Griffith that no custodiam of the lands late of Sir Edward Tyrrel in cos. Meath, West Meath and Kings County be granted to the heir or pretended heir of said Tyrrell till said Griffith be first heard. Notice to be given to Mr. Mawle at Berkeley House. Caveat Book, p. 33. Same of a caveat entered by Edwd. Horwood in behalf of the Bishop of London against any grant of the fine or pardon of Nicho. Charleton till said Bishop be heard. Notice to be given to said Horwood at Mr. Gibbons', a brazier in St. Albans Street. Ibid. Money warrant for 367l. 13s. 6d. to Sir Edward Clarke, kt., and Sir Francis Child, sheriffs of London and Middlesex, for the year ended 1691, Sept. 29; as in part of 864l. 13s. 10d. for expenses of removing prisoners, apprehending and convicting highwaymen and burglars. The said 367l. 13s. 6d. is to be satisfied out of 87l. 8s. 6d. due to be paid in [to the Exchequer by said sheriffs] on the 12d. Aid of 1 Wm. and Mary [c. 20], 270l. 5s. 0d. similarly on the Poll of 1 Wm. and Mary [c. 13], 10l. similarly on the Review of the Poll and the Additional Poll [1 Wm. and Mary, sess. 2, c. 7]. The balance of the said sum of 864l. 13s. 10d. is to be satisfied to them by allowance in their account. (Money order dated July 19 hereon.) Money Book XII, p. 108. Order Book IV, p. 19. 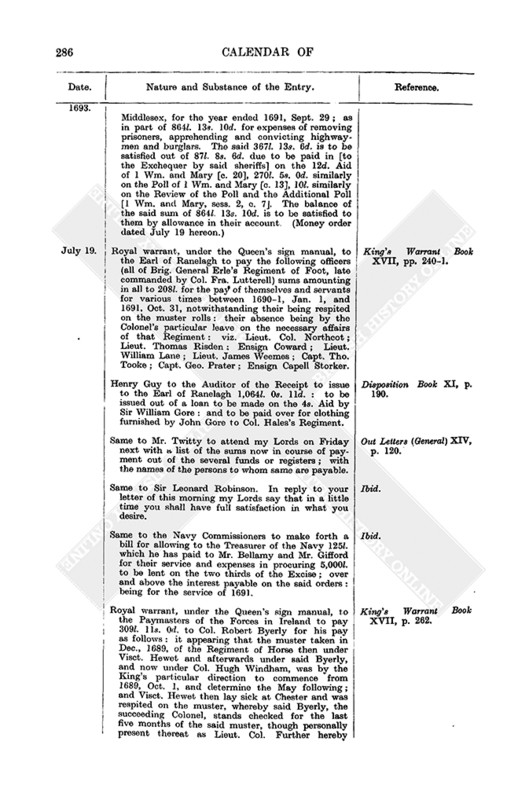 Royal warrant, under the Queen's sign manual, to the Earl of Ranelagh to pay the following officers (all of Brig. General Erle's Regiment of Foot, late commanded by Col. Fra. Lutterell) sums amounting in all to 208l. for the pay of themselves and servants for various times between 1690–1, Jan. 1, and 1691, Oct. 31, notwithstanding their being respited on the muster rolls: their absence being by the Colonel's particular leave on the necessary affairs of that Regiment: viz. Lieut. Col. Northcot; Lieut. Thomas Risden: Ensign Coward; Lieut. William Lane; Lieut. James Weemes; Capt. Tho. Tooke; Capt. Geo. Prater; Ensign Capell Storker. King's Warrant Book XVII, pp. 240–1. Henry Guy to the Auditor of the Receipt to issue to the Earl of Ranelagh 1,064l. 0s. 11d. : to be issued out of a loan to be made on the 4s. Aid by Sir William Gore: and to be paid over for clothing furnished by John Gore to Col. Hales's Regiment. Disposition Book XI, p. 190. Same to Mr. Twitty to attend my Lords on Friday next with a list of the sums now in course of payment out of the several funds or registers; with the names of the persons to whom same are payable. Out Letters (General) XIV, p. 120. Same to Sir Leonard Robinson. In reply to your letter of this morning my Lords say that in a little time you shall have full satisfaction in what you desire. Ibid. Same to the Navy Commissioners to make forth a bill for allowing to the Treasurer of the Navy 125l. which he has paid to Mr. Bellamy and Mr. Gifford for their service and expenses in procuring 5,000l. to be lent on the two thirds of the Excise; over and above the interest payable on the said orders: being for the service of 1691. Ibid. Royal warrant, under the Queen's sign manual, to the Paymasters of the Forces in Ireland to pay 309l. 11s. 0d. to Col. Robert Byerly for his pay as follows: it appearing that the muster taken in Dec., 1689, of the Regiment of Horse then under Visct. Hewet and afterwards under said Byerly, and now under Col. Hugh Windham, was by the King's particular direction to commence from 1689, Oct. 1, and determine the May following; and Visct. Hewet then lay sick at Chester and was respited on the muster, whereby said Byerly, the succeeding Colonel, stands checked for the last five months of the said muster, though personally present thereat as Lieut. Col. Further hereby 72l. 18s. 0d. is to be paid to La Grose, late chirurgeon to the said Regiment, for his pay for the whole eight months of said muster, his absence being due to his being then at Chester attending said Hewett as his physician. King's Warrant Book XVII, p. 262. Treasury warrant to the Receipt for tallies on the Excise for 5,000l. to Thomas Browne in repayment of the like sum lent thereon July 19 inst. Money Book XII, p. 107. Henry Guy to the Auditor of the Receipt to issue as follows out of the Exchequer, viz. : l. s. d. Disposition Book XI, p. 190. Out of 6,000l. on the Million Act; and 6,000l. of loans on the Excise: making 12,000l. in all. Out of loans on the Million Act. Out of loans on the 4s. Aid. Royal warrant, under the Queen's sign manual, to Sir Robert Cotton and Thomas Frankland, Postmasters General, to suffer no black box to be used hereafter for transporting letters and packets from the Secretaries of State to Scotland and from thence hither; but that each Secretary have his own pacquet for which the dues shall be marked down at the Post Office here and in Scotland according to the weight thereof; and that the charges thereof and of the flying pacquets be defrayed out of the profits of the postage betwixt Berwick and Edinburgh and back again: all as directed by a sign manual of the King dated March 23 last. King's Warrant Book XVII, p. 224. Same to the Attorney or Solicitor General for a great seal for a grant to Joseph Horneby of Furnivals Inn, of the cottage and barn called New Laith, ground called Boardales, Carr Ings and Fieldwood in the parish of Almondbury and in the tenure of Thomas Darby, gent., and a cottage and close in the parish of Kirkburton, now in the possession of John Malkin, and all other the lands etc. of Edmund Robinson, late of Blankend in the parish of Kirkburton, or his son Benjamin, forfeited by treason, of which said Robinson and his son were convicted at the General Gaol Delivery at the Castle of York 1690–1, March 14, for treason committed 1687, Dec. 1: to hold to the said Horneby and his heirs for ever: together with a clause to direct Henry Fairfax, late sheriff of Yorks, to deliver to said Horneby the goods and chattels which to the value of 66l. have been seized into his hands [of the said Robinson and his son]: the said Robinson's estate as above having been found by inquisition taken at Leeds 1692, Sept. 21, before Jasper Blythman, Michaell Idle and Thomas Leigh; at which inquisition were also found many debts (here detailed in full) owing to him from many persons in co. Yorks and Lanes. Ibid, pp. 225–8. Treasury warrant dormant to the Auditor and to the Receiver of Crown Revenues for co. Berks for the payment to the Mayor and churchwardens of Windsor of the annuity of 50l. for the support of the church and poor of New Windsor: and thereon to pay 25l. for the half year ended June 24 last. Money Book XII, p. 109. Money warrant for 500l. to Aaron Smith as imprest for Crown Law costs. (Money order dated July 22 hereon.) (Henry Guy to the Auditor of the Receipt, dated July 21, to issue same by way of advance till the regular order could be despatched.) Ibid, p. 110. Order Book IV, p. 20. Disposition Book XI, p. 191. Same for 100l. to same for same. (Money order dated July 26 hereon.) Money Book XII, p. 110. Order Book IV, p. 20. Henry Guy to the Navy Commissioners to make forth bills of imprest for 7,200l. to the Treasurer [of the Navy] for Sick and Wounded and to assign same on the tallies in said Treasurer's hands for wear and tear: same being to complete 14,200l. for this year's proportion for Sick and Wounded on the head of wear and tear. Disposition Book XI, p. 190. Same to the Auditor of the Receipt to issue to Richard Harris, gent., the 1,000l. paid into the Exchequer for the fine of the lease of Post Groats. Ibid, p. 191. Same to same to issue 1,000l. to Mr. Braguiere for the French Protestants, out of seizures [by way of advance]: on warrants to be prepared (see infra under date July 26). Ibid. Same to the Customs Commissioners to send to Visct. Sidney's house in St. James's Square his goods which are coming in the Navy yacht from Ireland. Out Letters (General) XIV, p. 120. Same to Mr. Aldworth to deliver to Charles Fox the vouchers and other papers desired relating to the Danish Forces. Ibid, p. 121. Same to the Attorney General to enter a noli prosequi to the indictments against Ann Todd and 13 others, detailed, lessees of part of the estate lately belonging to Visct. Preston, for a forcible entry. Ibid. 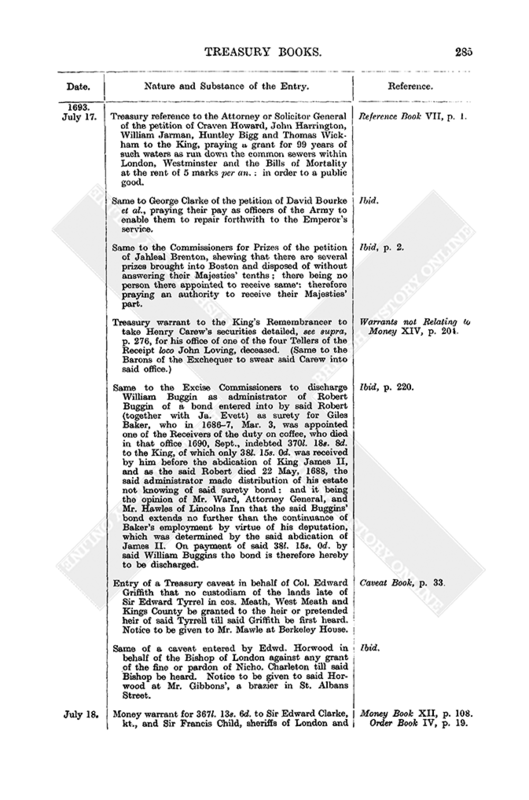 Same to same to report on the enclosed petition of Sir Thomas Domvill, with the report of Sir Richard Levings, Solicitor General, Ireland, thereon: being concerning 3,000l. lent by said Domvill to James Talbott of Temploge in Ireland, who is outlawed. Ibid. Same to the Customs Comissioners, enclosing an Order of Council on the petition of Sir James Houblon and other merchants for three ships to go to Spain. Have you any objection? Ibid. Henry Guy to the Commissioners of Transports. My Lords have read your to-day's estimate of what the freight of all the transport ships for 1693 will amount to, supposing the ships in the Thames to de discharged by Aug. 17 next, the Plymouth and Dartmouth ships by Aug. 31 next and the Bideford ships and others belonging to the Bristol Channel by Sept. 17 next. My Lords approve your proposals and direct you to discharge the said transport ships “to the several days abovementioned.” My Lords agree that interest shall be allowed them from the said respective days of discharge. Out Letters (General) XIV, p. 122. Treasury reference to the Commissioners of Excise and Hearthmoney Arrears of the petition of Thomas Amy, shewing that he was actually employed about 1¼ years as Receiver General of Hearthmoney in Kent, Surrey, Suusex and Herts in collecting the arrears thereof for 1689, Lady day; therefore praying a salary for that time. Reference Book VII, p. 2. Same to the Commissioners of Transports of the petition of several masters of ships hired by the Transports Commissioners, praying for one month's pay in hand [for their ships] and one month's pay more after having served four months, [as they] not receiving any money are not able to proceed in the service according to charter party. Ibid. Treasury warrant to the Surveyor General of Crown Lands for a particular of Barton of Bradridge in Cornwall in order to a new lease thereof to John Hoblyn at 10l. per an. and fine of 350l. Warrants not Relating to Money XIV, pp. 205–6. Prefixing: report by Mr. Tailer on said Hoblyn's petition for same. Mr. Thomas Gewen had the inheritance of the premises descended to him by grant from Edw. VI, but he submitted the title to the Prince's Council in the time of James I and took a lease for three lives in 4 Charles I. In 1650 he purchased the inheritance for 1,500l. The three lives put in, in 4 Charles I, died before 1660. In 1661, Dec. 11, his son took a new lease for the lives of him and John and Nicholas Row at the old rent of 10l. per an. and 50l. per an. increment, being the half of the improved value: and fine of 300l. In July, 1670, George Hele, husband of Sarah daughter of the elder Gewen, prayed a new lease, which Sir Charles Harbord valued at 150l. for the addition to the estate and 500l. for buying off the increased rents. 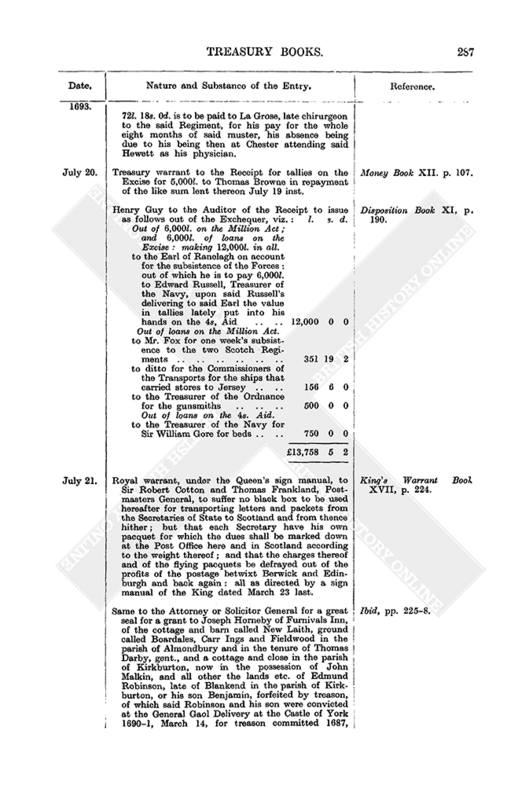 These fines were granted to Lord Hawley, and Sarah Hele, widow of said George, paid Lord Hawley 550l. on the lease passed 1671, Aug. 4. On 31 July, 1683, William Symonds, husband of said Sarah Hele, obtained a new lease at 350l. fine, Mr. Harbord valuing the tenement at 100l. per an. above the rent. The petitioner Hoblyn married said Symonds' only child. The barton is valued in Norden's survey in the time of Charles I at 119l. per an. ; in the Parliamentary Survey it is valued at 200l. per an., and was sold in 1650 to William Cornby, a cornet in the Army, for 1,420l., of whom Gewen bought for 1,200l. In 1661 Secretary Morice and others living near the place certified it not worth more than 140l. per an. The petitioner Hoblyn produces a certificate from Major Glyn and others living near the place, and John Vigures, an ancient servant who has known the barton for 60 years, that it cannot be let for above 100l. per an. and that it was always rated at but 72l. 10s. 0d. per an. 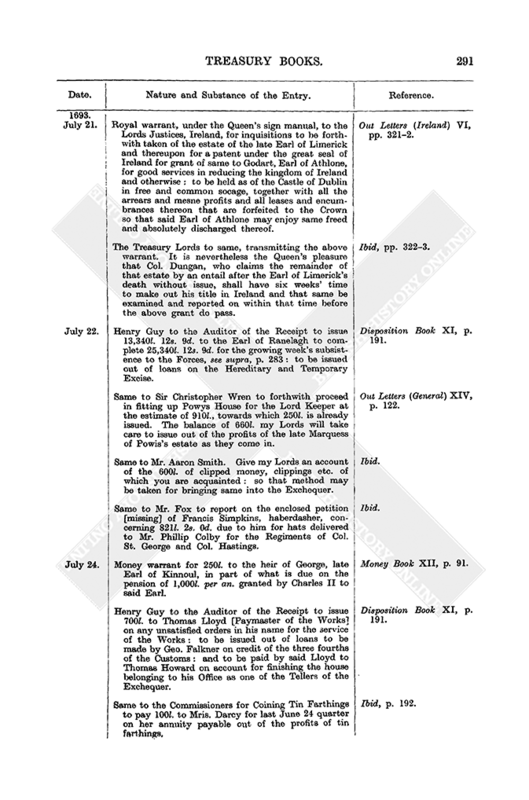 The Treasury Lords to the Lords Justices, Ireland, to report on the enclosed petition [missing] of John Kent and Nicholas Fenn, executors of Richard Kent, esq., concerning the 5,000l. lent by the said Richard to Sir Patrick Trant on mortgage of the manors of Castle Lea, Grange Moor and other towns and lands in Ireland. Out Letters (Ireland) VI, p. 319. Henry Guy to the Commissioners of Enquiry [concerning Forfeited Lands, Ireland]. In reply to yours of the 11th inst., my Lords find no sufficient reason therein to stop the custodiam to Lieut. Gen. Talmache. You are to pass it without further delay. Ibid. Appending: list of said prisoners: l. s. d.
Royal warrant, under the Queen's sign manual, to the Lords Justices, Ireland, for inquisitions to be forthwith taken of the estate of the late Earl of Limerick and thereupon for a patent under the great seal of Ireland for grant of same to Godart, Earl of Athlone, for good services in reducing the kingdom of Ireland and otherwise: to be held as of the Castle of Dublin in free and common socage, together with all the arrears and mesne profits and all leases and encumbrances thereon that are forfeited to the Crown so that said Earl of Athlone may enjoy same freed and absolutely discharged thereof. Out Letters (Ireland) VI, pp. 321–2. The Treasury Lords to same, transmitting the above warrant. It is nevertheless the Queen's pleasure that Col. Dungan, who claims the remainder of that estate by an entail after the Earl of Limerick's death without issue, shall have six weeks' time to make out his title in Ireland and that same be examined and reported on within that time before the above grant do pass. Ibid, pp. 322–3. Henry Guy to the Auditor of the Receipt to issue 13,340l. 12s. 9d. to the Earl of Ranelagh to complete 25,340l. 12s. 9d. for the growing week's subsistence to the Forces, see supra, p. 283: to be issued out of loans on the Hereditary and Temporary Excise. Disposition Book XI, p. 191. Same to Sir Christopher Wren to forthwith proceed in fitting up Powys House for the Lord Keeper at the estimate of 910l., towards which 250l. is already issued. The balance of 660l. my Lords will take care to issue out of the profits of the late Marquess of Powis's estate as they come in. Out Letters (General) XIV, p. 122. Same to Mr. Aaron Smith. Give my Lords an account of the 600l. of clipped money, clippings etc. of which you are acquainted: so that method may be taken for bringing same into the Exchequer. Ibid. Same to Mr. Fox to report on the enclosed petition [missing] of Francis Simpkins, haberdasher, concerning 821l. 2s. 0d. due to him for hats delivered to Mr. Phillip Colby for the Regiments of Col. St. George and Col. Hastings. Ibid. Money warrant for 250l. to the heir of George, late Earl of Kinnoul, in part of what is due on the pension of 1,000l. per an. granted by Charles II to said Earl. Money Book XII, p. 91. Henry Guy to the Auditor of the Receipt to issue 700l. to Thomas Lloyd [Paymaster of the Works] on any unsatisfied orders in his name for the service of the Works: to be issued out of loans to be made by Geo. Falkner on credit of the three fourths of the Customs: and to be paid by said Lloyd to Thomas Howard on account for finishing the house belonging to his Office as one of the Tellers of the Exchequer. Disposition Book XI, p. 191. Same to the Commissioners for Coining Tin Farthings to pay 100l. to Mris. 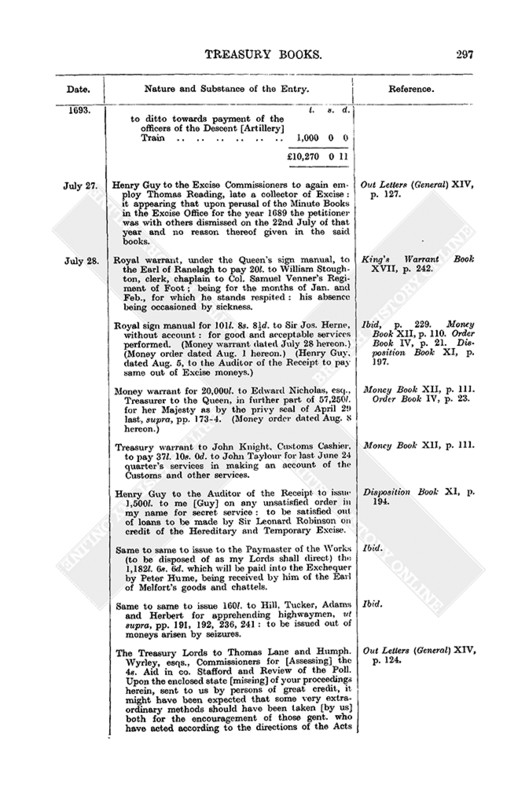 Darcy for last June 24 quarter on her annuity payable out of the profits of tin farthings. Ibid, p. 192. Henry Guy to Mr. Aaron Smith to pay 100l. to George Macy for charges he will be at in prosecuting many clippers and false coiners at the next Assizes for Chelmsford, the Oxford circuit and other places under the directions of the Warden of the Mint. Disposition Book XI, p. 192. Same to Mr. Fox to pay 10l. to Major Edmond Power in part of his arrears. Ibid. Same to the Auditor of the Receipt to issue 615l. 7s. 5d. to the Earl of Ranelagh on any unsatisfied order in his name for the Forces: to be issued out of loans to be made by said Earl on credit of the 4s. Aid and to be applied as follows, viz. : 115l. 7s. 5d. for interest due to William Wallis for money advanced to Col. Trelawny's and Col. Luttrell's Regiments at their going for Ireland, “which their Lordships promised him should be paid”; and 500l. to the Earl of Oxford for his personal pay as Col. and Capt. of the Royal Regiment of Horse and for his servants from 1692, April 1, to 1692–3, Jan. 1. Ibid. Same to same to issue 1,642l. 9s. 11½d. to Charles Fox and Lord Coningesby on any unsatisfied order in their name for the Forces in Ireland: to be issued out of loans to be made by said Fox on credit of the 4s. Aid: and to be applied as follows, viz. : l. s. d. Ibid, p. 193. Same to the Customs Commissioners to permit the export to Scotland, Customs free, of clothes, swords etc. for the Regiments of Lord Strathnaver and Sir James Moncreif. Out Letters (General) XIV, p. 122. Same to the Earl of Ranelagh to insert in his next [weekly] memorial for money 25l. 17s. 6d. for John Flower for so much due to him and his wife as belonging to the Marching Hospital in Flanders on the descent in 1692: according to said Earl's report on Flower's petition. Ibid, p. 123. Same to the [Principal] Officers of the Ordnance to forthwith put a stop to any growing charge in the Ordnance Office on account of the preparations lately directed to be made there in order to a descent into France. Ibid. Same to Mr. Robinson to report on the enclosed letter [missing] from the Commissioners for Stating the Accounts of the Army in Ireland. Ibid. Henry Guy to Mr. Feilding. 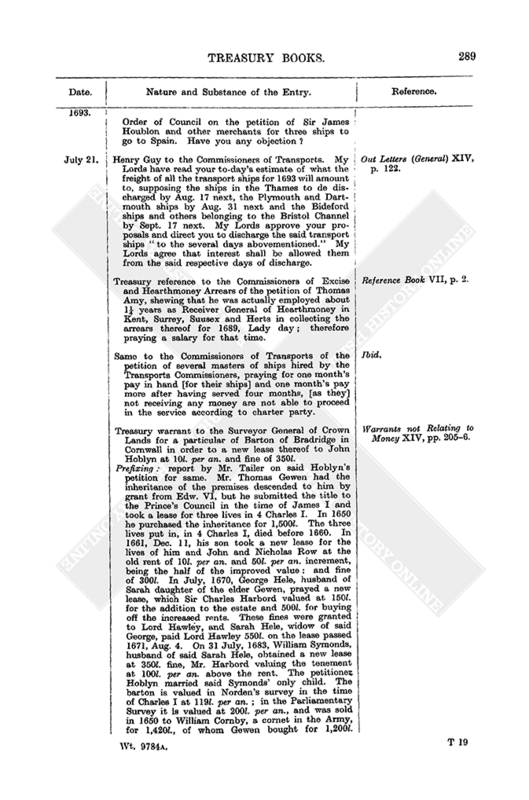 Send my Lords your answer to the enclosed petition of John Barker, baker, concerning a debt due to him for the service of the descent in 1692: shewing that he only received 12l. 17s. 6d. towards the item of 38l. 2s. 0d. for which he gave a full receipt to Feilding, but cannot get a note from him for the remainder. Out Letters (General) XIV, p. 123. Treasury order to the Trustees for Sale of Fee Farm Rents to convey rents as follows to Sir Christopher Wren as in reprisal of rents purchased by him in co. Lincoln to the value of 4l. 5s. 10d. per an., which have proved illeviable, the value whereof at 16 years' purchase (68l. 13s. 4d. ), with the arrears thereon from 1672, Michaelmas, to 1692, Michaelmas (90l. 2s. 6d. ), amounts to 158l. 15s. 10d. In reprisal thereof he is hereby to have other rents in the same county of the yearly value of 9l. 18s. 5d. per an. (making at 16 years' purchase 158l. 14s. 8d.). Warrants not Relating to Money XIV, p. 206. Henry Guy to the Revenue Commissioners, Ireland, to report on the enclosed petition of Major Edmund Power, praying that the 680l. 10s. 7¼d. due to him on account of his Troop may be satisfied out of the rent of 150l. per an. which he is to pay for a farm in co. Kerry. Out Letters (Ireland) VI, p. 323. Royal sign manual for 1,000l. to Richard Harris, gent., as royal bounty: without account. (Money warrant dated July 26 hereon.) (Money order dated July 28 hereon.) King's Warrant Book XVII, p. 229. Money Book XII, p. 110. Order Book IV, p. 28. Same for 1,000l. to John Braguiere, without account: to be distributed among the distressed French Protestants in this kingdom: as the Queen's charity and benevolence towards their relief and subsistence. (Money warrant dated July 26 hereon.) (Money order dated July 28 hereon.) King's Warrant Book XVII, p. 229. Money Book XII, p. 110. Order Book IV, p. 28. 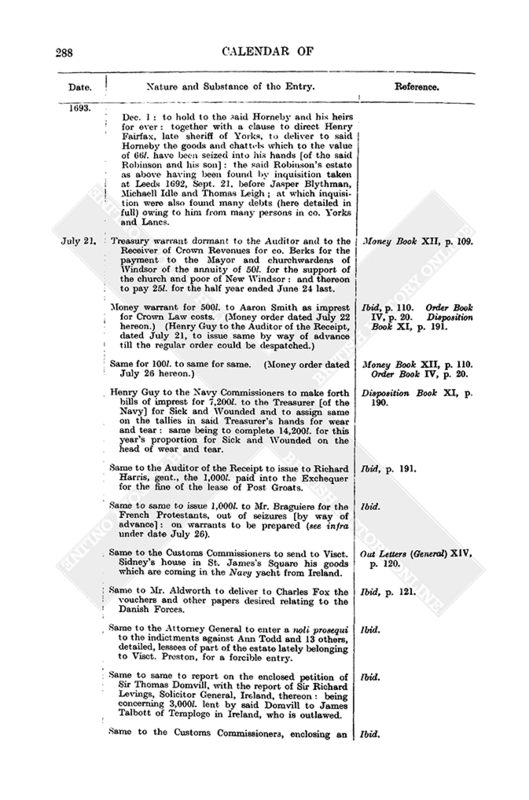 Money warrant for 1,909l. 12s. 9d. to Sir Leonard Robinson, without account: 674l. 12s. 9d. thereof for his charges and expenses in receiving and paying into the Exchequer [loans from the citizens of London to the amount of] 242,340l. on the 4s. Aid and in receiving back and paying out sums to the amount of 254,060l. and the interest thereof lent by divers citizens on the fourth quarter of the Poll and on the credit clauses of the Act for same: the remaining 1,235l. to be as reward for his pains and attendance therein: to be satisfied out of loans to be made by said Robinson himself on credit of the Hereditary and Temporary Excise. (Money order dated July 27 hereon.) Money Book XII, p. 110. Order Book IV, p. 20. Treasury warrant to the Receipt for tallies on the Excise for 1,000l. for Thomas Browne in repayment of the like sum lent by him thereon the 21st inst. Money Book XII, p. 111. Same to the Auditors of Imprests to allow to Thomas Lloyd in his accounts as Paymaster of the Works the 4,411l. 3s. 8d. which at several times from 1689, Nov. 30, to 1692, Oct. 1, he has paid to Capt. Michael Studholme for the charges of making and repairing tho roads in Hyde Park and St. James's Park for their Majesties' private use: on the production of said Studholme's acquittances for same. Ibid, p. 114. Henry Guy to the Auditor of the Receipt to issue 190l. to me [Guy] for secret service. Disposition Book XI, p. 194. Same to same to issue 100l. to Mr. Aaron Smith on the unsatisfied order in his name for [Crown] law suits. Ibid. Same to same to issue 9,799l. 4s. 9d. 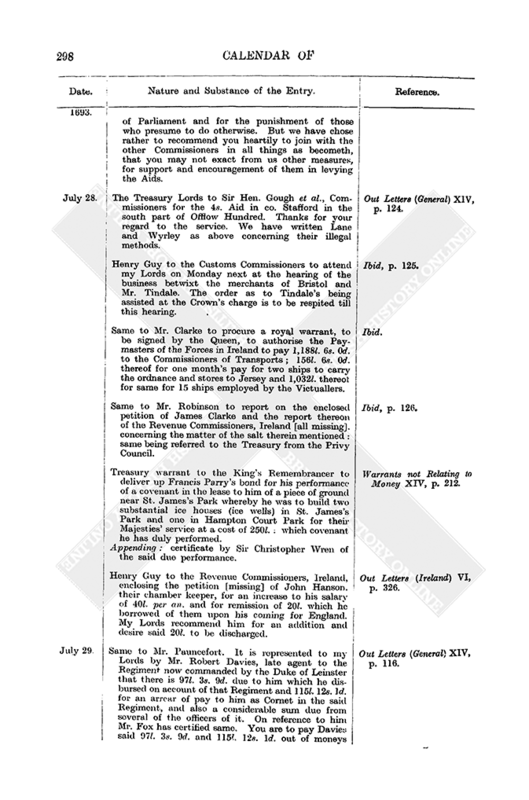 to Charles Fox and Thomas Coningsby on any unsatisfied orders in their names for the service of the Forces late in Ireland: to be issued out of loans to be made by said Fox on credit of the three fourths of the Customs: and to be paid to the Commissioners of the Transport Service to answer a half year's interest to June 24 last to the masters and owners of the ships employed in transporting the Forces from 1689, June, to 1691–2, Jan. 1, for their several debts amounting to 326,641l. 5s. 3d. Ibid, p. 196. Same to Mr. Fox to report on the enclosed petition of Sarah Land, widow (in the margin Woodland apparently incorrectly). Out Letters (General) XIV, p. 123. Same to Mr. Bernard. Notwithstanding yours and Mr. Tindale's letters my Lords have determined to hear the matter between him and the merchants of Bristol on Friday next. Ibid. Same to the Attorney General to report (with King's counsel) on the enclosed memorial [missing] from the Customs Commissioners with a state [missing] of the case concerning goods not rated in the Book of Rates. Ibid, p. 124. 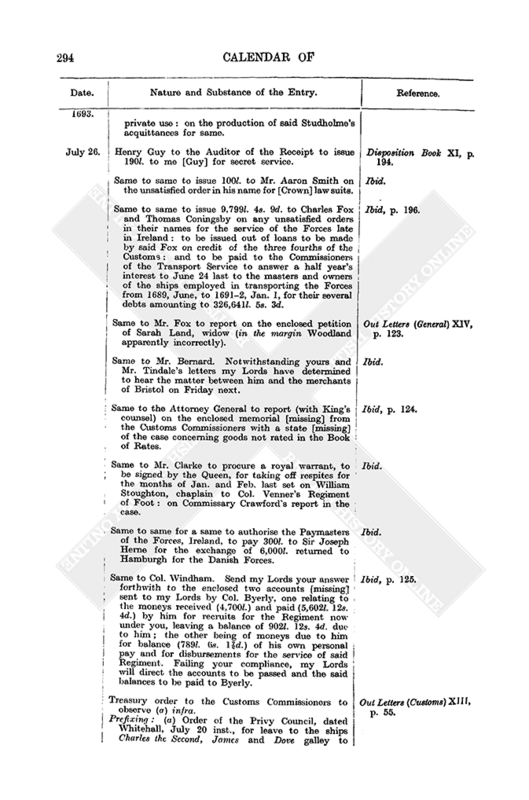 Same to Mr. Clarke to procure a royal warrant, to be signed by the Queen, for taking off respites for the months of Jan. and Feb. last set on William Stoughton, chaplain to Col. Venner's Regiment of Foot: on Commissary Crawford's report in the case. Ibid. Same to same for a same to authorise the Paymasters of the Forces, Ireland, to pay 300l. to Sir Joseph Herne for the exchange of 6,000l. returned to Hamburgh for the Danish Forces. Ibid. Same to Col. Windham. Send my Lords your answer forthwith to the enclosed two accounts [missing] sent to my Lords by Col. Byerly, one relating to the moneys received (4,700l.) and paid (5,602l. 12s. 4d.) by him for recruits for the Regiment now under you, leaving a balance of 902l. 12s. 4d. due to him; the other being of moneys due to him for balance (789l. 6s. 17/8d.) 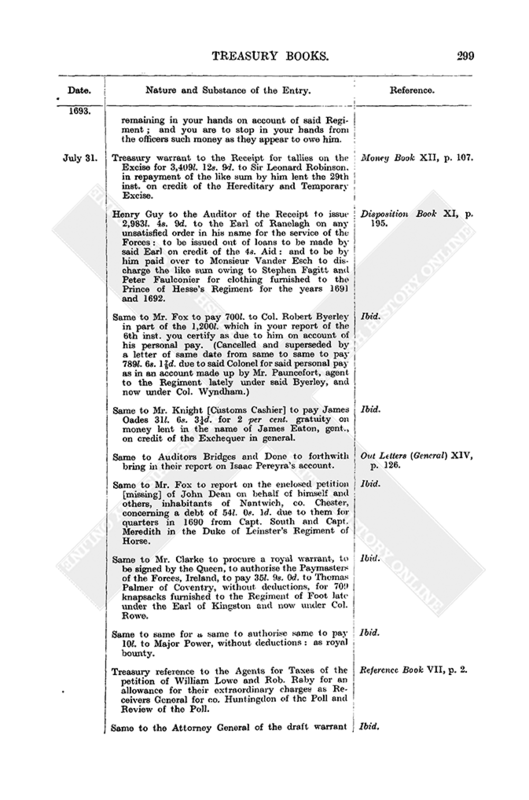 of his own personal pay and for disbursements for the service of said Regiment. Failing your compliance, my Lords will direct the accounts to be passed and the said balances to be paid to Byerly. Ibid, p. 125. Treasury order to the Customs Commissioners to observe (a) infra. Out Letters (Customs) XIII, p. 55. 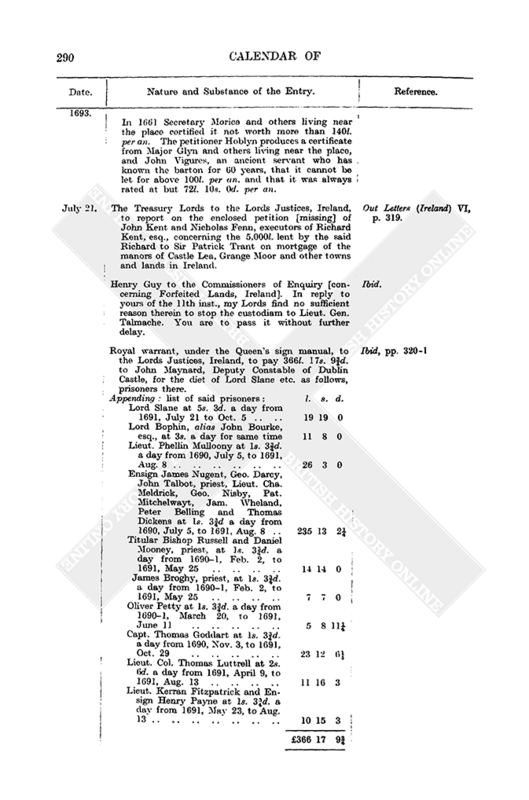 Prefixing: (a) Order of the Privy Council, dated Whitehall, July 20 inst., for leave to the ships Charles the Second, James and Dove galley to proceed in their voyage to Spain; on the petition of Sir James Houblon et al., merchants of London. Treasury warrant to Edward Ward, esq., Attorney General, to enter a noli prosequi to the information against some raw silk seized by John Ward, a Customs officer of London port. Out Letters (Customs) XIII, p. 56. Treasury reference to the Customs Commissioners of the petition of Tho. Penington, a King's waiter, London port, praying to surrender his place to Edward Buck, his relation, who is qualified for same. Reference Book VII, p. 2. Entry of the Treasury Lords' signature of the docquet of a lease to George Pyle at the nomination of John Rooke of three tenements in the Castle Close at Exeter, ut supra, p. 255. Warrants not Relating to Money XIV, p. 207. Treasury warrant to the Clerk of the Pipe for a lease to Ferdinando Foster of ground formerly called Trematon Park etc. for 99 years at 26s. 8d. and the Justing Peece for same terminable on two lives in reversion of Elizabeth Finch at 2s. per an. rent and fines of 70l. and 10s. respectively, ut supra. p. 209. (For the signature of the docquet see infra under date Sept. 27.) Ibid. Same to same for a same to Thomas Johnson, esq., of the premises (Liskeard Park etc. ), ut supra, pp. 209–10, for 99 years terminable on three lives (including his own and that of Henry Manaton) at the ancient rents of 25l. 5s. 0d. (For the signature of the docquet see infra under date Sept. 27.) Ibid, p. 208. Same to same for a same to Richard Tregear of two tenements in Boyton, co. Cornwall, ut supra, p. 210, at the old rents of 10s. 5d. and 14s. 5d. and fine of 160l. (For the signature of the docquet see infra under date 4 April, 1694.) Ibid. Same to same for a same to John Hoblyn, esq., of the Barton of Bradridge, ut supra, p. 289, at the ancient rent of 10l. and fine of 350l. (For the signature of the docquet see infra under date Nov. 18.) Ibid, p. 209. Same to the Trustees for Sale of Fee Farms to make a reprisal to Richard Reeve as follows, viz. in place of several defective rents in co. Lincoln of the value of 5l. 12s. 3d. per an. (total value at 16 years' purchase with arrears thereon from 1672, Mich., to 1692, Mich., 207l. 13s. 3d.) to convey to him other rents in the said county of the yearly value of 12l. 19s. 6d. (capital value at 16 years' purchase being 207l. 12s. 0d.). Ibid. Same to the Surveyor General of Crown lands for a particular of the passage over the river Trent and six acres of land in East Stockwith, co. Lincoln, in order to a lease thereof to the inhabitants of East Stockwith for 31 years at 10l. 8s. 6d. per an. rent and fine of 55l. Ibid, pp. 210–11. 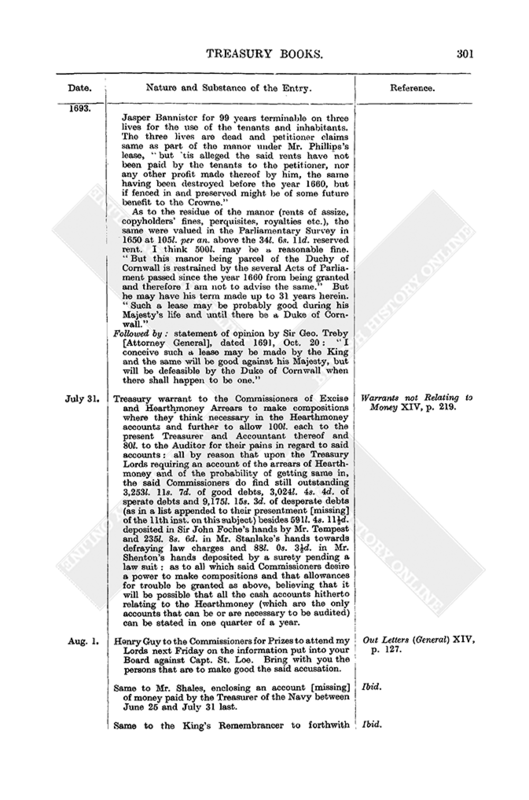 Prefixing: Mr. Tailer's report on the petition of said inhabitants for same. The premises were granted by Charles I when Prince 1620, Nov. 28, to Roger Gregory, Thomas Abot and Phillip Hawksworth in trust for the inhabitants of East Stockwith for 21 years: in 1641 they contracted with Charles II (then Prince) for a further 31 years therein at a fine of 30l. but the wars breaking out I know not whether said fine was paid, the accounts of the subsequent years having been lost in those times. At the Restoration in 1660 the inhabitants employed William Midwinter, then deputy steward of the soke of Kirton, whereto the premises belong, to obtain a new lease, but Midwinter obtained a grant in his own name for 31 years from 1662, Lady day, at the old rent of 10s. and 30s. increase for the passage and 14d. old rent and 50s. increase for the land. The petition of the present inhabitants was referred to Mr. Fisher in 1687, but he died soon after. Royal warrant, under the Queen's sign manual, to the Lords Justices, Ireland, for a patent under the great seal of Ireland for remitting and releasing to Charles, Earl of Mountrath, and his heirs the rents reserved on the custodiam of the several lands in Ireland granted to him for three years under the patent of 1693, April 28, supra, pp. 177–8, in pursuance whereof by indenture dated 1693, May 16, between said Earl of the one part and Charles Dering, John Weaver and John Nelmes, Commissioners of Inspection into Forfeitures, of the other part, there were demised to the said Earl a long list of lands, here detailed, in the baronies of Salt, co. Kildare, and Upper Ossory, Queen's County at a total rental of 906l. 3s. 8d., which rent the Crown is pleased to remit to him for said three years in consideration of many faithful services. The usual quit rents and Crown rents on said lands are not hereby to be discharged. Out Letters (Ireland) VI, pp. 323–5. Henry Guy to the Auditor of the Receipt to issue as follows out of the Exchequer, viz. : l. s. d. Disposition Book XI, p. 193. Out of 5,691l. 14s. 10d. of loans on the Million Act; 2,249l. 1s. 3d. of loans on the 4s. Aid; 1,308l. 18s. 6¼d. of the complements of the Excise; 1,020l. 6s. 3¾d. of the Review of the Poll: making 10,270l. 0s. 11d. in all. Henry Guy to the Excise Commissioners to again employ Thomas Reading, late a collector of Excise: it appearing that upon perusal of the Minute Books in the Excise Office for the year 1689 the petitioner was with others dismissed on the 22nd July of that year and no reason thereof given in the said books. Out Letters (General) XIV, p. 127. 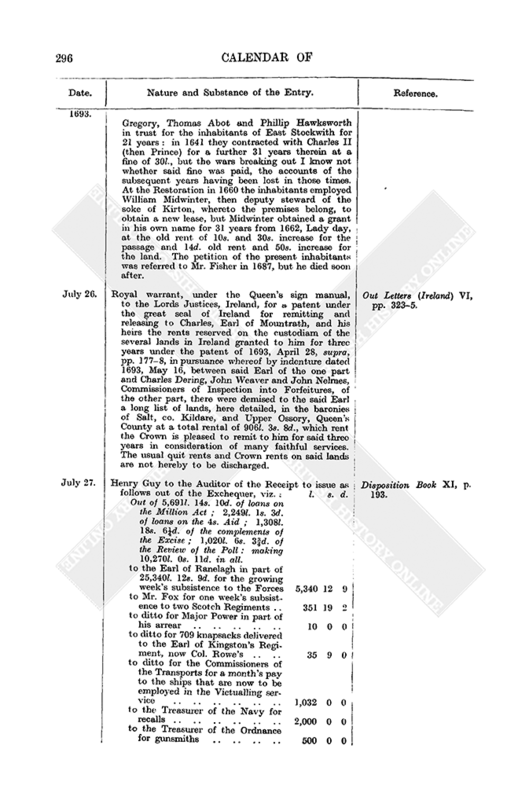 Royal warrant, under the Queen's sign manual, to the Earl of Ranelagh to pay 20l. to William Stoughton, clerk, chaplain to Col. Samuel Venner's Regiment of Foot; being for the months of Jan. and Feb., for which he stands respited: his absence being occasioned by sickness. King's Warrant Book XVII, p. 242. Royal sign manual for 101l. 8s. 8½d. to Sir Jos. Herne, without account: for good and acceptable services performed. (Money warrant dated July 28 hereon.) (Money order dated Aug. 1 hereon.) (Henry Guy, dated Aug. 5, to the Auditor of the Receipt to pay same out of Excise moneys.) Ibid, p. 229. Money Book XII, p. 110. Order Book IV, p. 21. Disposition Book XI, p. 197. Money warrant for 20,000l. to Edward Nicholas, esq., Treasurer to the Queen, in further part of 57,250l. for her Majesty as by the privy seal of April 29 last, supra, pp. 173–4. (Money order dated Aug. 8 hereon.) Money Book XII, p. 111. Order Book IV, p. 23. Treasury warrant to John Knight, Customs Cashier, to pay 37l. 10s. 0d. to John Taylour for last June 24 quarter's services in making an account of the Customs and other services. Money Book XII, p. 111. Henry Guy to the Auditor of the Receipt to issue 1,500l. to me [Guy] on any unsatisfied order in my name for secret service: to be satisfied out of loans to be made by Sir Leonard Robinson on credit of the Hereditary and Temporary Excise. Disposition Book XI, p. 194. Same to same to issue to the Paymaster of the Works (to be disposed of as my Lords shall direct) the 1,182l. 6s. 6d. which will be paid into the Exchequer by Peter Hume, being received by him of the Earl of Melfort's goods and chattels. Ibid. Same to same to issue 160l. to Hill, Tucker, Adams and Herbert for apprehending highwaymen, ut supra, pp. 191, 192, 236, 241: to be issued out of moneys arisen by seizures. Ibid. The Treasury Lords to Thomas Lane and Humph. Wyrley, esqs., Commissioners for [Assessing] the 4s. Aid in co. Stafford and Review of the Poll. Upon the enclosed state [missing] of your proceedings herein, sent to us by persons of great credit, it might have been expected that some very extraordinary methods should have been taken [by us] both for the encouragement of those gent. who have acted according to the directions of the Acts of Parliament and for the punishment of those who presume to do otherwise. But we have chose rather to recommend you heartily to join with the other Commissioners in all things as becometh, that you may not exact from us other measures, for support and encouragement of them in levying the Aids. Out Letters (General) XIV, p. 124. The Treasury Lords to Sir Hen. Gough et al., Commissioners for the 4s. Aid in co. Stafford in the south part of Offlow Hundred. Thanks for your regard to the service. We have written Lane and Wyrley as above concerning their illegal methods. Out Letters (General) XIV, p. 124. Henry Guy to the Customs Commissioners to attend my Lords on Monday next at the hearing of the business betwixt the merchants of Bristol and Mr. Tindale. The order as to Tindale's being assisted at the Crown's charge is to be respited till this hearing. Ibid, p. 125. Same to Mr. Clarke to procure a royal warrant, to be signed by the Queen, to authorise the Paymasters of the Forces in Ireland to pay 1,188l. 6s. 0d. to the Commissioners of Transports; 156l. 6s. 0d. thereof for one month's pay for two ships to carry the ordnance and stores to Jersey and 1,032l. thereof for same for 15 ships employed by the Victuallers. Ibid. Same to Mr. Robinson to report on the enclosed petition of James Clarke and the report thereon of the Revenue Commissioners, Ireland [all missing], concerning the matter of the salt therein mentioned: same being referred to the Treasury from the Privy Council. Ibid, p. 126. Treasury warrant to the King's Remembrancer to deliver up Francis Parry's bond for his performance of a covenant in the lease to him of a piece of ground near St. James's Park whereby he was to build two substantial ice houses (ice wells) in St. James's Park and one in Hampton Court Park for their Majesties' service at a cost of 250l. ; which covenant he has duly performed. Warrants not Relating to Money XIV, p. 212. Appending: certificate by Sir Christopher Wren of the said due performance. Henry Guy to the Revenue Commissioners, Ireland, enclosing the petition [missing] of John Hanson, their chamber keeper, for an increase to his salary of 40l. per an. and for remission of 20l. which he borrowed of them upon his coming for England. My Lords recommend him for an addition and desire said 20l. to be discharged. Out Letters (Ireland) VI, p. 326. Same to Mr. Pauncefort. It is represented to my Lords by Mr. Robert Davies, late agent to the Regiment now commanded by the Duke of Leinster that there is 97l. 3s. 9d. due to him which he disbursed on account of that Regiment and 115l. 12s. 1d. for an arrear of pay to him as Cornet in the said Regiment, and also a considerable sum due from several of the officers of it. On reference to him Mr. Fox has certified same. You are to pay Davies said 97l. 3s. 9d. and 115l. 12s. 1d. out of moneys remaining in your hands on account of said Regiment; and you are to stop in your hands from the officers such money as they appear to owe him. Out Letters (General) XIV, p. 116. Treasury warrant to the Receipt for tallies on the Excise for 3,409l. 12s. 9d. to Sir Leonard Robinson, in repayment of the like sum by him lent the 29th inst. on credit of the Hereditary and Temporary Excise. Money Book XII, p. 107. Henry Guy to the Auditor of the Receipt to issue 2,983l. 4s. 9d. to the Earl of Ranelagh on any unsatisfied order in his name for the service of the Forces: to be issued out of loans to be made by said Earl on credit of the 4s. Aid: and to be by him paid over to Monsieur Vander Esch to discharge the like sum owing to Stephen Fagitt and Peter Faulconier for clothing furnished to the Prince of Hesse's Regiment for the years 1691 and 1692. Disposition Book XI, p. 195. Same to Mr. Fox to pay 700l. to Col. Robert Byerley in part of the 1,200l. which in your report of the 6th inst. you certify as due to him on account of his personal pay. (Cancelled and superseded by a letter of same date from same to same to pay 789l. 6s. 17/8d. due to said Colonel for said personal pay as in an account made up by Mr. Pauncefort, agent to the Regiment lately under said Byerley, and now under Col. Wyndham.) Ibid. Same to Mr. Knight [Customs Cashier] to pay James Oades 31l. 6s. 3¼d. for 2 per cent. 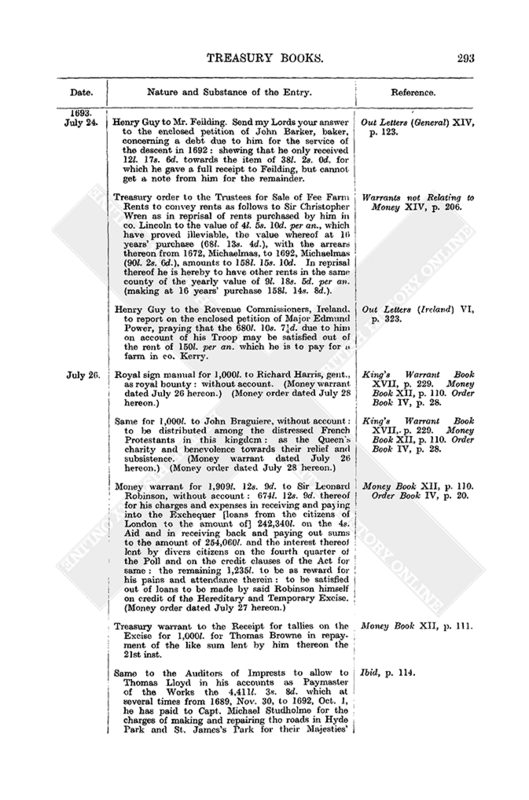 gratuity on money lent in the name of James Eaton, gent., on credit of the Exchequer in general. Ibid. Same to Auditors Bridges and Done to forthwith bring in their report on Isaac Pereyra's account. Out Letters (General) XIV, p. 126. Same to Mr. Fox to report on the enclosed petition [missing] of John Dean on behalf of himself and others, inhabitants of Nantwich, co. Chester, concerning a debt of 54l. 0s. 1d. due to them for quarters in 1690 from Capt. South and Capt. Meredith in the Duke of Leinster's Regiment of Horse. Ibid. Same to Mr. Clarke to procure a royal warrant, to be signed by the Queen, to authorise the Paymasters of the Forces, Ireland, to pay 35l. 9s. 0d. to Thomas Palmer of Coventry, without deductions, for 709 knapsacks furnished to the Regiment of Foot late under the Earl of Kingston and now under Col. Rowe. Ibid. Same to same for a same to authorise same to pay 10l. to Major Power, without deductions: as royal bounty. Ibid. 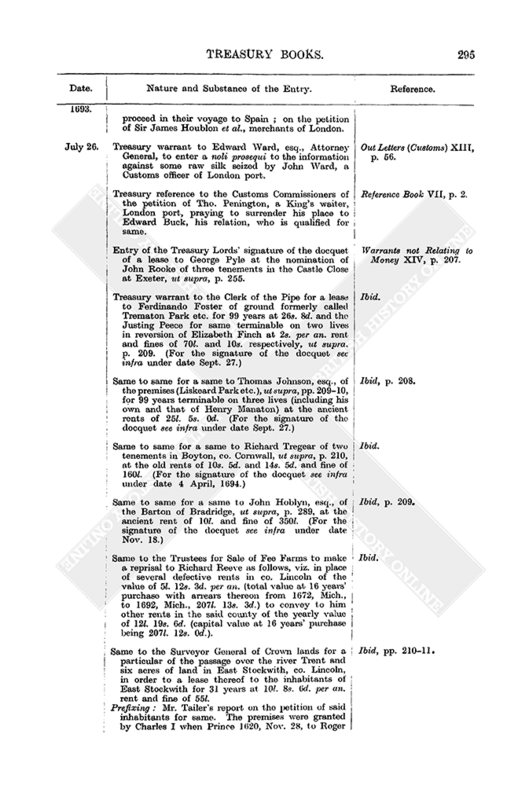 Treasury reference to the Agents for Taxes of the petition of William Lowe and Rob. Raby for an allowance for their extraordinary charges as Receivers General for co. Huntingdon of the Poll and Review of the Poll. Reference Book VII, p. 2. Same to the Attorney General of the draft warrant for discharging the East India Company from the King's tenths of prizes taken from the Great Mogul and likewise from a moiety of all ships taken that traded to the East Indies without the King's licence and likewise from all mulcts. Ibid. Treasury reference to the Commissioners of Excise and Hearthmoney Arrears of the petition of Rich. Morris and Christopher Mason, late collectors of Hearth-money, shewing that in 1688 they were appointed collectors of [Hearthmoney in] Monmouthshire and being sent into Carmarthenshire before they had finished the collection, they charged themselves with the whole arrear, intending to come back: but the Revolution coming on and [they] being detained in Wales they could never collect the arrears: therefore praying to be allowed same. Reference Book VII, p. 2. Entry of the Treasury Lords' signature of a docquet of an in custodiam lease under the Exchequer seal to Mary Purefoy, spinster, of lands in Hartshorne, co. Derby, parcel of the lands of Samuel Barwell, outlaw: at a rent of 16d. per an. and fine of 2s. 8d. Warrants not Relating to Money XIV, p. 211. The like of a same to Grisell Lawrence of lands in co. Cornwall, parcel of the lands of William Silly, outlaw: at a rent of 41s. 4d. and fine of 4l. 2s. 8d. Ibid. Treasury warrant to the Clerk of the Pipe for a lease to Sir Mathew Andrews of the manor of Mere, co. Wilts., with the demesnes, warren and park, at yearly rents as follows, viz. : 31l. 10s. 0d. for the demesne lands and Barton; 4l. for the sheep pasture or coney warren; 10l. for the park; for 23 years' term therein from 1701, Lady day; also the wood ground called Deverlongwood, with the several coppices and a wood called Knowlewood, for 99 years terminable on three lives at rents of 55s. and 40s. respectively and 60s. for a herriot. Ibid, pp. 213–15. Treasury warrant to the Commissioners of Excise and Hearthmoney Arrears to make compositions where they think necessary in the Hearthmoney accounts and further to allow 100l. each to the present Treasurer and Accountant thereof and 80l. to the Auditor for their pains in regard to said accounts: all by reason that upon the Treasury Lords requiring an account of the arrears of Hearthmoney and of the probability of getting same in, the said Commissioners do find still outstanding 3,253l. 11s. 7d. of good debts, 3,024s. 4s. 4d. of sperate debts and 9,175l. 15s. 3d. of desperate debts (as in a list appended to their presentment [missing] of the 11th inst. on this subject) besides 591l. 4s. 11½d. deposited in Sir John Foche's hands by Mr. Tempest and 235l. 8s. 6d. in Mr. Stanlake's hands towards defraying law charges and 88l. 0s. 3½d. in Mr. Shenton's hands deposited by a surety pending a law suit: as to all which said Commissioners desire a power to make compositions and that allowances for trouble be granted as above, believing that it will be possible that all the cash accounts hitherto relating to the Hearthmoney (which are the only accounts that can be or are necessary to be audited) can be stated in one quarter of a year. Warrants not Relating to Money XIV, p. 219.